You’ll need only 12 spoons to make a super dessert. Don't waste time preparing a complicated dessert, follow this simple recipes and make a delicious one. You will need just 12 spoons to prepare a unique and soft cake that will conquer everything at the first taste. Ingredients: 3 eggs; a pinch of salt; 12 tbsp sugar; 12 tbsp lemon juice; 12 tbsp vegetable oil; 12 tbsp milk; 12 tbsp flour; 16g baking powder. 1)Beat together the eggs, salt and sugar. 2) Add the liquid ingredients and then the sifted flour. 3) You won’t need to use a scale, just a spoon to measure out all the ingredients for this cake. 4) Mix all the ingredients together well and pour them in a silicon bundt cake mold. 5) Bake at 180°C for at least 35 minutes. Let the cake cool and dust with powdered sugar. 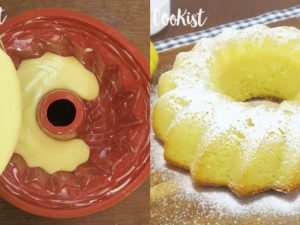 3 perfect dessert for lemon lovers! Prepare a delicious savory cake using a yogurt cup: a brilliant idea!